A shooting at Highland High School in Palmdale Friday left a student wounded and a former student in custody, authorities said. The injured student, a 15-year-old boy, was driven to a hospital by a parent who was dropping her daughter off at school shortly after the 7 a.m. shooting at the campus in the 39000 block of 25th Street West. The victim suffered a gunshot wound to his shoulder area and was hospitalized in stable condition, Los Angeles County Sheriff's Jim McDonnell said at an afternoon news briefing. The 14-year-old male suspect was taken into custody at a Vons grocery store about a mile from the campus. There were no reports of any other injuries. McDonnell said the sheriff's department was contacted by an off-duty Los Angeles Police Department officer who initially apprehended the suspect after being contacted by the boy's father about 7:40 a.m.
A Highland High School student told KNX Newsradio that he saw the teen suspect emerge from a bathroom with a rifle-type weapon, which he randomly pointed at people. The student said the suspect looked at him and told him to run, which he did, shouting at other students to do the same. McDonnell identified the weapon as an SKS with 7.62 rounds. The rifle was recovered from a field between the school and where the boy was apprehended. 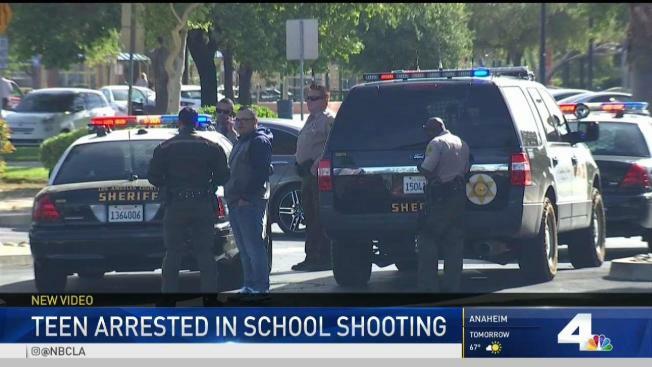 A parent told KNX that his wife was dropping their daughter off at the school when the wounded student ran up to her car, shouting "He shot me! He shot me! I don't know why he shot me!" The woman told the boy to get into her car and she drove him to a nearby hospital, the parent said, adding that his wife was interviewed by sheriff's deputies and was told the "little boy is going to be fine," but he "didn't know who shot him." The shooting was initially reported as an active shooter, prompting a massive response from law enforcement, including the Los Angeles County Sheriff's Department and the Bureau of Alcohol, Tobacco, Firearms and Explosives. About 30 minutes after the high school shooting was reported, the sheriff's department also responded to a call of gunshots being heard at the nearby campus of Manzanita Elementary School in the 38600 block of 33rd Street East, but those reports turned out to be unfounded. Sheriff's Capt. Darren Harris said earlier that deputies believe the suspect was acting alone. There was no immediate word on a motive for the shooting. The suspect fired about 10 rounds and told his father that he had fired into the air, McDonnell said. All schools in the area were placed on lockdown while law enforcement swarmed the high school campus, and nervous parents began gathering nearby, anxiously hoping to retrieve their children. The lockdown at Highland High School was lifted around 10:20 a.m., and students were being released to parents on Avenue P-12 south of the campus. McDonnell said the sheriff's Palmdale Station fielded nearly 100 calls in the minutes after the shooting. A warrant was served at the boy's home about 11 a.m., McDonnell said. That investigation is continuing. The high school and others in the Antelope Valley Union High School District will be open on Monday with counselors on hand, an assistant superintendent said. The suspect used to attend Highland High School but his family transferred him to another school, officials said.